For the past ten years, Helen Adams has devoted her life to covering the Vietnam War. When she first arrived in Vietnam in 1965, Helen’s only encounter with war had been her father’s tales of the Korean War and her brother’s letters home, and her only experience with photography was a high school class. Against all odds—and under the mentorship of the famed Sam Darrow—Helen begins to make a name for herself as the war’s first female photojournalist. As Helen embarks on a passionate affair with Darrow, she also falls in love with Vietnam and its people. Helen begins pressuring Darrow to leave with her and begin a new, safe life together in the States. But Darrow’s work consumes him, and he continues to push the limitations of luck. When tragedy befalls the couple, Helen abandons the idea of leaving the war and pours herself into her work with greater passion than ever before. Before, there had been this small, shiny thing inside her that had kept her immune from what was happening, and now she knew it had only been her ignorance, and she felt herself falling into a deep, dark place. As she becomes more invested in her work and the lush country surrounding her, Helen becomes more detached from others and herself. Linh, a stoic Vietnamese man who hides behind his own immense sorrow, is attracted to this beautiful and broken foreigner. After the destruction of his village, Linh wrapped himself in the memories of those he lost, becoming extremely isolated even in the bustling streets of Saigon. Even if he could reach past the barriers Helen has erected, could he betray the loved ones who continue to haunt him? After long years of conflict, the Americans begin withdrawing from Saigon, and Helen struggles with the decision to go “home” to Southern California or to stay and document the momentous takeover of Vietnam’s capital by the North Vietnamese Army. 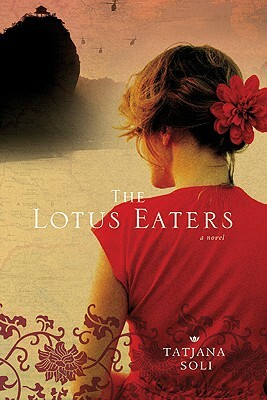 The Lotus Eaters explores love and obsession, fear and fulfillment, belonging and betrayal. Soli’s tight prose reflects the jarring hardness of war, the allure of obsession, and the tenderness of love in turns. One came to love another through repeated touch, he believed, the way a mother bonded with her newborn, the way his family had slept in the communal room, brushing against one another, the patterning through nerve endings, a laying of pulse against pulse, creating a rhythm of blood, and so now he touched others, strangers, only fleetingly, without hope. Ironically, Linh is an outsider in his country’s war; he observes but takes as little a part as possible in the Vietnamese and American sides of the conflict. Linh’s mixed allegiance—to the SVA and NVA; to his bosses, Helen and Darrow; to his former and future loves—reflects the tumultuous and undefinable conflict around them. Linh serves as an embodiment of the Vietnamese people, torn between two sides and hoping only to forget the pain that has descended upon their lives. The air boiled hot and opaque, the sky a hard, saline blue. For miles the black mangrove swamp spread like a stagnant ocean, clotted, arthritic. Farther on they passed the swollen tributaries of the Mekong. Papaya, grapefruit, water palm, mangosteen, orange—fruit of every variety grew in abundance, dropping with heavy thuds on the ground to burst in hot flower in the sun. After three days, Helen no longer thought of the crooked apartment or Saigon. Even Darrow changed from a pain outside, inflicted, to something inside, a tumor, with only its promise of future suffering. The fastness of the jungle struck her again in all its extraordinary voluptuousness, its wanton excess. It enchanted. Time rolled in long green distances, and she took comfort in the fact that the land would outlast them, would outlast the war—would outlast time itself. Helen’s journey becomes more than simply covering conflict; she falls in love with a land and its people, and these are perhaps the only things that can save her. Soli’s exploration of the emotional and physical effects of the war on all sides—Vietnamese and American, soldier and civilian—delivers a simultaneously heartwrenching and heartwarming story. The prose can be terse and jarring at times, but that only serves to reinforce the atmosphere of war around the characters. At other times, the descriptions are sumptuous and enveloping to reflect the characters’ amorous or nostalgic feelings. This book was a solid and enjoyable read, and I would recommend it to anyone interested in Vietnam and its conflicts. Jack also reviewed a novel about the Vietnam War recently, Matterhorn. For more reviews of The Lotus Eaters, check out all the tour stops! I really enjoyed this one too! I’m hoping to read Matterhorn soon as well and look at the different perspectives on the Vietnam War. Great review! Just want to point out that the cover you show is for the hardcover, and we’re promoting the trade pb with this tour. But, no matter, I’m thrilled you enjoyed it. I agree with your assessment that it was heart wrenching and heartwarming. So true. Thank you so much for being on the tour! So glad you enjoyed the book! Great review. Thank you so much for being on the tour.